With nearly 7 million riders per day on its 16 lines, the Moscow Metro is the sixth-busiest metro system in the world as of March 2019. Riding the Moscow Metro, however, does not need to be a stressful experience. In fact, it's by far the easiest and most enjoyable way to get around Moscow, especially since many Moscow Metro stations are veritable works of art. Our guide to the public transportation will teach you how to ride the Metro and more. Here is some essential practical information you need to know to easily and seamlessly ride the Moscow Metro. Fares: Moscow Metro fares start at 55 rubles for a one-way ticket, which is good for five days after purchase. You'll pay more if your journey takes you outside of the central Moscow zones of A and B, though this is not the case for most tourists. How to Pay: Cash is the only way to buy a one-way ticket. However, if you have Apple Pay or Samsung Pay, you can tap your phone directly at the ticket gate and enter using NFC technology. You can also use both mobile payments and credit cards to top-up your reloadable Troika card. Routes and Hours: The Moscow Metro has 13 lines that snake and criss-cross the city, plus outer and inner loop lines that string them together, as well as a monorail. The Moscow Metro is open from approximately 5:30 a.m. to 1 a.m., and trains run with a frequency that can range between 1 and 7 minutes. Service Alerts: Download the official MosMetro app on the AppStore or Google Play. Transfers: Regardless of how you pay to enter the Moscow Metro, you can transfer to any of the core lines plus the Moscow Monorail without passing through an additional ticket gate. If you wish to transfer to bus lines, airport trains or other rail services, paying with Troika or your mobile device might be more convenient. Accessibility: Although Moscow Metro is impressive and modern in many ways, it is not very accessible. Visitors who use wheelchairs should try to avoid the subway and take aboveground transportation instead. Aviamotornaya: Brilliant gold themed to the flight of Icarus. 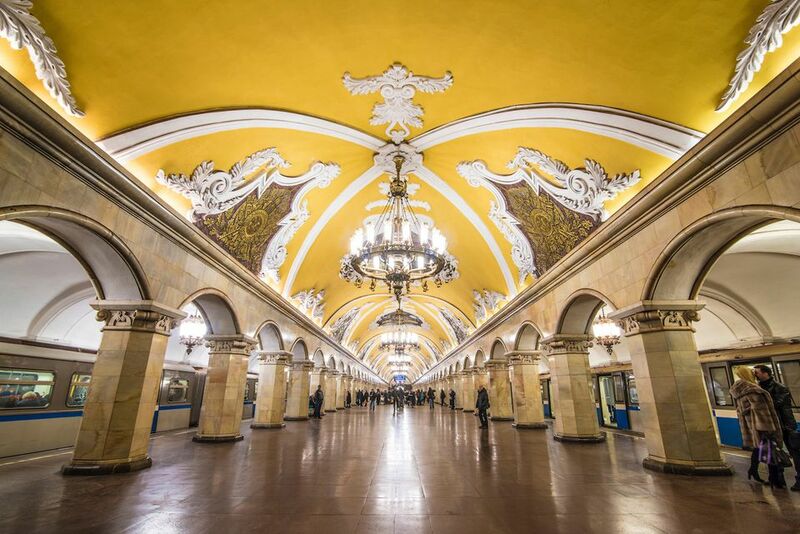 Komsomolskaya: Bright yellow ceilings and murals chronicling Russia's journey to independence. Park Pobedy: Modern station (built in 2003) with colorful murals; one of the deepest metro stations in the world (276 feet below ground!). Ploschad Revolutsii: Constructed in 1938 at the height of Soviet pride, this station is home to bronze statues that locals still rub for good luck. Although it's technically legal to take pictures within the Moscow Metro, guards might approach you if you spend too long photographing a particular station, or use professional equipment like a tripod. Be as discreet as possible to avoid an uncomfortable confrontation! In addition to the (mostly) subterranean transport offered by the Moscow Metro, Russia's capital is home to a number of aboveground transport options. This includes a large network of buses, as well as trams and "trolley buses." While these are all cheaper than the Moscow Metro, they also require some command of Russian to use; the ordinary buses are also subject to sitting in Moscow's terrible traffic. In terms of payment, your Moscow Metro ticket isn't valid for transit to any other form of transit, though a Troika card will allow you to do so seamlessly. Likewise, while the various Aeroexpress trains (between Sheremetyevo Airport and Belorussky Station, Domodedovo Airport and Paveletsky Station and between Vnukovo Airport and Kievsky Station) feature modern vehicles and offer fast, reliable connections to Moscow's major airports, these lines are not considered to be part of the Moscow Metro system. As noted earlier, the Moscow Metro is technically organized by "Zone," with the center of Moscow being occupied by the "A" and "B" zone. Again, you shouldn't worry too much about this. If you're hanging out in the parts of the city, you probably speak enough Russian to be able to ask a local for advice! The bad news? It is exceedingly unlikely that a taxi drive in Moscow will speak English. The good news? Uber works in Moscow as of March 2019, which means that if you have the app installed on your smartphone (and a Russian SIM card, which you can pick up at Moscow Airport), your next Moscow ride is basically a matter of plug-and-play. Russia also has a number of homegrown ride sharing apps, though these aren't as ubiquitous as Uber — they also don't have good English-language interfaces. If you're interested in learning more about them, in any case, be sure to visit the websites of InDriver or Taxi Maxim. Keep in mind that many of these applications require Russian credit cards, or a Russian bank account to pay for rides. Security-wise, the technological aspect of using ride sharing apps in Russia makes them relatively safe. On the other hand, taxis have a dodgy reputation at best. If you do end up needing to take a taxi in Moscow, make sure to use a registered car. The ones waiting at the airport stands are generally legitimate; within the city limits, try and have your hotel call a taxi to be safe. Traffic in Moscow is reliably awful, to say nothing of how difficult navigating the city's serpentine network of ring roads and one-way streets can be. However, if you do want to rent a car in Moscow (or in Russia, more generally) there are some facts you should keep in mind. Documentation wise, it's not officially necessary to carry an International Driving Permit (IDP) — your US driver's license will work, at least if you plan to drive in Russia for less than six months. However, it might serve you well to get an IDP (you can apply at your local AAA office) for peace of mind. In Russia as in the US, you drive on the right side of the road; gas costs about 40 rubles per liter, or about $2.40 per gallon. Another potential downfall of renting a car of Russia is the threat of interactions with Russian traffic police. While this doesn't put you in any mortal danger, there is a chance you'll have to bribe your way out of any confrontation, which outside the center of Moscow or other Russian cities will almost certainly necessitate some Russian language skills. Moscow's city center is very walkable. Unless you're visiting on a bitterly cold day during the middle of winter, many of Moscow's attractions are close enough together that you could walk. For example, you can easily walk from Red Square to Gorky Park, Bolshoy Theatre, Pushkin State Museum of Fine Arts, the Kremlin or simply along the Moskva River. All roads lead to Red Square. Although Moscow is not a grid-pattern city, it is relatively organized. The majority of major roads start and end at Red Square; the rest are circular ones that connect the "spokes" from Red Square. With this basic idea in mind, it's pretty difficult to get lost in Moscow! Moscow's awful traffic means that rail is usually the quickest option. Even if the physical distance between two places is shorter by car, traveling via the Moscow Metro is probably going to be quicker. English signage in Moscow has greatly improved over the years. On the other hand, familiarizing yourself with the Cyrillic alphabet before your trip to Russia probably wouldn't be a bad idea. If you need to push someone out of the way (spoiler alert: you probably will! ), say izvineetye (sorry) to excuse yourself. Petty theft is common, especially during rush hour. Wear your backpack in front of your body, and don't keep large amounts of cash (or your smartphone!) in your back pocket. Hide any conspicuous signs of wealth to avoid being a target! The Moscow Metro is easy to use—once you get the hang of it. After all, more than two billion trips take place across its rails every year. If it were difficult, this simply wouldn't be possible! Want to learn more about things to do in Moscow? Make sure to check out this guide to Red Square, which is both the geographical and cultural heart of Moscow (and arguably Russia).